A Denture or false teeth is a dentistry device to replace your missing teeth. There are many denture designs depending on the problems to be solved. Your dentist can provide you with a full dentures if you lost all your teeth. Partial dentures are for those who still have some teeth in their mouth. A conventional denture is removable. You can move it from your mouth for cleaning. Some others are fixed, attached to your remaining teeth or to dental implants. It means the dentist only can remove them. How does a denture work ? A conventional denture has a pink colored acrylic base that goes onto your gums. The upper denture covers the palate because of stability need. The lower denture has a “c” shape to leave enough space for the tongue. False teeth are always custom-made starting from impressions of your mouth. The partial denture base, instead, is a metal framework that supports prosthetic crowns. False gums will avoid the metal part being visible. If you lost all your teeth, there are two types of dentures to choose from: removable full dentures or a fixed. Fixed full dentures are supported by dental implants inserted in your jaw. The alternative is to attach them to your remaining teeth with screws or dental cement. Fixed full dentures can be with or without false gums (flange). It depend on the quantity of bone you lost. The most known complete fixed dentures are: Toronto Bridge, full-dental-arch and overdenture (on natural teeth or mini-implants). The cost of fixed prosthesis is more expensive than a removable one. 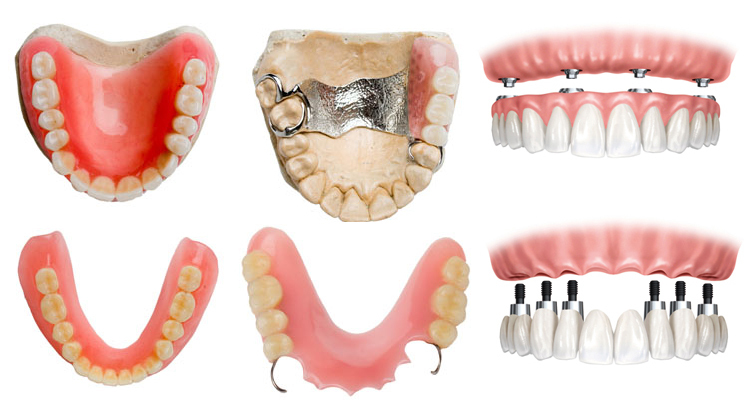 Removable full dentures are the standard dental prosthesis we all know. They are made of acrylic pink false gums and resin teeth. The soft and hard tissues of the oral cavity are the natural support for removable dentures. You can remove your full denture anytime; for daily oral care purpose or before to go to sleep. Temporary full dentures can be the solution while waiting for implants to integrate with the bone. Just to avoid you to remain without teeth. Removable full dentures are the most affordable false teeth on the market. You still have some of your teeth ? This is a good news. There are types of dentures that can help you to improve your life quality and appearance. Usually these devices are removable. Let’s take a look at how they work. A partial denture is built on a metal framework that attaches to natural teeth. The prosthetic dental elements are made of resin or porcelain. False gums will hide the metal structure. Flexible dentures are an alternative to metal partials. This type of dentures is made of flexible material (nylon) that attaches to your teeth with specials hooks. When natural teeth need crowns to support metal partial dentures then the dental divice is called “combined”. It’s nothing strange, just a name for a dental prosthesis. Even a crown and a dental bridge are partial prosthesis too. Think about this: they replace one or a few missing teeth. The difference is that crowns and bridgeworks are fixed. What is an immediate denture ? Unlike conventionals, immediate denture can be worn immediately after teeth removing. Before the extractions, your dentist will take your dental impressions. The technician can use the model to build the new denture. Gums can heal even with the immediate denture in place. With conventional devices the patient has to wait until gums are ok. In the meantime that person remains without teeth in the mouth. It is a big improvement. This type of dentures avoid you to stay 3 months without speaking and eating well. How is getting dentures ? The dentures creation procedure takes a few weeks and appointments. Fist your dentist has to evaluate witch type of dentures is best in your case. The second step is: dental and jaw impressions. When the model is ready, the development process starts. You need several “fittings” before to get your final denture. Once the denture fits perfectly the gums, it’s time to adjust the aesthetic. It’s possible choose the shape and the color of dental elements. That’s why a denture can improve your smile. Once all the above steps are done, you will get your denture and your new life starts. How to get used to my false teeth ? When you wear a new denture for the first time, you may feel a bit strange. Something new is in your mouth. Muscles and cheeks have to learn how to keep it in place. Tongue has to find its room. You need practice to feel comfortable inserting and removing the dentures. Depending on each person, saliva flow may increase for a short period. Because of the first rubbings, you may experience minor irritation or soreness. Eating and speaking with your new teeth is the most difficult part to learn. You need practice but it is nothing impossible. Everything said is normal. After a few weeks you will forget every issues and you will enjoy your new teeth. My denture doesn’t fit any more, what can I do ? A denture remain always the same while your mouth changes. Since you lost your natural teeth, bone and gums started to reabsorb. It happens slowly. You cannot see changes in one night. Over a period of time, it may happen that the denture doesn’t fit your gums any more. Even the dentures adhesive is not useful to keep it in place. Dentures begin to feel loose, cause discomfort and sores. If all that happens, it means that denture need to be relined, remade, or rebased. Relining means making a new base. You should consider to visit your dentist twice a year for a checkup. False teeth cleaning and caring. Like your teeth, you should brush your dental prosthesis after each meal. It’s necessary to remove food particles and plaque from mouth and from your new teeth. Remove your denture from your mouth in a comfortable place. If your dental prosthesis falls down it may get broken. First, rinse your denture with tepid water without any soap. Just plain water. Gently remove food residues and plaque using a soft bristle toothbrush. Buy non-abrasive toothpaste. It may scratch the false gums. Remember to clean you gums, tongue, cheeks and palate. A good quality mouthwash (clorexidina 0,05%) can help you to avoid soft tissue irritation and bad breath. When you go to sleep, be sure to put the denture in a safe place. It is better to put it in a glass of water or in a damp little towel. If denture gets dry they tend to change its shape. With a few or no teeth at all in the mouth you may experience issues eating and speaking. Your self-esteem goes down. Your will avoid social meeting. You do not feel well with yourself. Even your overall healthy condition will suffer because of the poor diet. Without dental element it’s hard to eat all what you want. You have to stay with soft or liquid food. Replacing missing teeth will improve your appearance and your health. Dentures make it easier to eat and speak better. It will take a short time to spell well “t”, “f” and “s” letters. It is not all. When you lose all of your teeth, facial muscles relax. The result is that even your face skin sags. In short, you will look older than you are. Chewing well is a good exercise for mouth muscles. After a short time your face will look younger. How can dentures improve my smile ? Let’s say your natural teeth ware not straight in the right position. Their color was not white enough. You may ask your dentist the white grade you prefer and the dental elements shape you most like. It doesn’t change the dentures cost so much. Still in doubt ? Call your dentist right now to set an appointment ! You will never regret. How much do dentures cost ? Insurances may cover the dentures cost in different ways or not to cover it at all. Let’s see how much do denture cost without insurance first. Then we I will show you where to find affordable dentures. To calculate the price of a set of false teeth, you should know there are different type of dental prosthesis. Low-cost or affordable dentures cost $300 to $600 per arch (or per set of teeth). It means for upper or lower denture you may pay 600 to 1,200 dollars. What are the features of low-cost dentures over the others ? For that cheap price you cannot expect a custom made device. The plastic material quality will be very low. The resin used for the dental elements is the most basic one. For that low price dentists can offer low income people to speak and eat again. The downside is the aesthetic level. It will be easy to guess you are wearing a prosthetic device. Mid-priced dentures cost $600–$1,500 per arch. Bough arches are about 1,200 to 3,000 dollars. For this amount of money you will get a custom-made divice. You can try the dentures before the final result. It means that your prosthetic device will fit your gums perfectly. In addition, you can choose false gums and teeth color from a wide range. An up to two years warranty is usually included in the final price. Premium or expensive dentures cost $2,000 to $5,000 each arch. The prosthetic device will be completely customized. Teeth and gums are very close to the natural one. It will be very difficult to recognize you have a denture. It’s not rare to get a lifetime warranty against cracking and relining services. You should ask your dentist witch services you get for each price. Does my dental insurance cover the denture price ? The question is simple but the answer is not. It depends on your insurance. Let’s see some examples. Standard insurances may cover basic dental services. It means: fillings, root canal and partial or complete denture repair. For major services like bridge, implants and dentures you need to pay an insurance add-on. It may happen the claimed add-on is more expensive than the dentures fee requested by the dentist. The percent of coverage may also vary when treatment is done by a non-network dentist. For more information about denture insurance coverage, I strongly recommend you to ask your provider before to start any treatment. This is a very hot topic. Not all people can deal with false teeth price. It’s an expensive prosthetic device for many low income seniors. Let’s see some ways to get discounted prices. Many dentists do provide flexible payment plans. How does it work ? It is simple. Your doctor will allow you to spread the price of denture over a few months. In this way dentists do not loose patients and people without insurance can get affordable dentures. Do not forget that, even if there is no insurance coverage you may try to find third-party financing services. Get dentures with Medicaid benefits. Let’s see how it works and if you can be a candidate. Medicaid may cover part of the dentures cost. Medicaid is a state-funded program that may help adults in getting dentures or dental services. Not all States cover these services in the same way. There is also great variance in what Medicaid offers in each state. Some states do not cover dentures at all. Some others limit coverage to one denture set every five or ten years. Others limit coverage to certain populations. Still others limiting coverage to conditions associated with trauma or disease. On this page you can find a table with States and related Medicaid coverage policies. Dentists in training or Dental schools. During training seminars or at dental schools you can get your dental prosthesis for a lower cost. A student does the job. An experienced dentist will check that everything is done properly. It is not a bad way to save money. That’s good to know that you can get fixed dentures. This is nice since my mom is looking to get dentures since she’s missing teeth. I’ll have to tell her this so she won’t have to worry about removing them. Glad this article was helpful for you and your mom. I had no idea that dentures were able to help improve your life quality and appearance by filling in the spaces made by teeth that you are missing. My mother has lost a bunch of her teeth over the years, and she is considering finding a way to regain her smile. It may be good for her to visit a dentist and see if she qualifies for a full denture. your mom may consider the possibility to get dentures on mini dental implants that can highly improve the dental prosthesis stability.